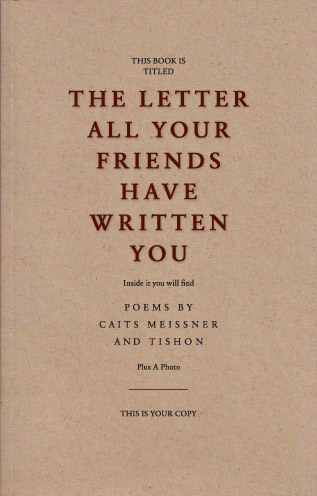 Caits Meissner and Tishon are two writers living in New York City. The Letter All Your Friends Have Written You marks their first collaborative book. The poems in the collection explore a range of experience and emotion, mingling classic themes of love and war with ruminations on mixtapes, basketball and growing up with The Fresh Prince of Bel Air. Under headphones, Mavis Staples crawls into the hurting parts. into the tiny cracks. Shimmies up the pipe of my heart. Stomps her feet against the wound. Rolls her eyes. Says, toughen up, mama, this ain’t the end of the story, yet. She holds a kettle beneath my tear ducts. Shakes her head and throws it on the stove. on her apron, how you feel, child, she asks. to be in the NBA. Caits Meissner, winner of the OneWorld Poetry Contest, attended the 2008 inaugural Pan-African Literary Forum in Accra, Ghana where she studied under Pulitzer Prize winner Yusef Komunyakaa and other luminaries from the literary African diaspora. In addition to her own self-released work, she has been published in various literary journals. She is also an arts educator and designer. Tishon is a writer, designer, and publisher. He is the founder of Well&Often and a founding member of BBOXradio.com. Tishon lives in Brooklyn.